A 3-year old boy is transferred from an outside facility for ENT consult after failed removal of a foreign body in the left ear. The patient was sedated but the object was unable to be removed with suction or forceps. The patient is in no distress and has an obvious lime green foreign body in the left ear. In this case we knew the extraction would be difficult and conventional maneuvers were unsuccessful with forceps and suction despite sedation. When typical strategies fail, we have used a novel technique for certain cases that we have had great success although with a limited number of cases. I have personally used this method 3 times and it has worked perfectly each time. Remove the otoscope but leave the speculum in place showing only the foreign body at the end of the speculum. You can use an overhead procedure light or head lamp to help with visualization at this point. Apply medical glue to the tip of a Q-tip and immediately insert into the speculum making light contact with the foreign body. Wait 30 seconds and remove the entire apparatus. This method should only be used in certain circumstances. There is a risk of getting medical glue in the ear canal or worsening the impaction by gluing the object in place although this is why we use the speculum to reduce this risk. The patient will need to be able to be calm and not move, again to reduce the risk of glue where you don’t want it. This will work best with smooth objects where you can get the speculum flush on the surface to make a seal. As always, you should discuss the risks and benefits with the patient. If you or the patient are uncomfortable at all, use an alternative method or consult ENT for removal with a microscope. 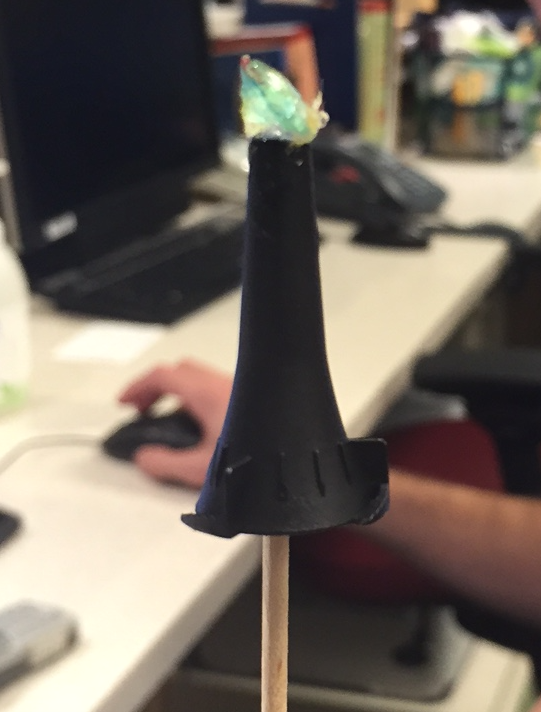 Using the Stick+Glue+Cone method above, I was able to remove a green plastic gem from the child’s ear in less than a minute, saving a consultation with ENT. 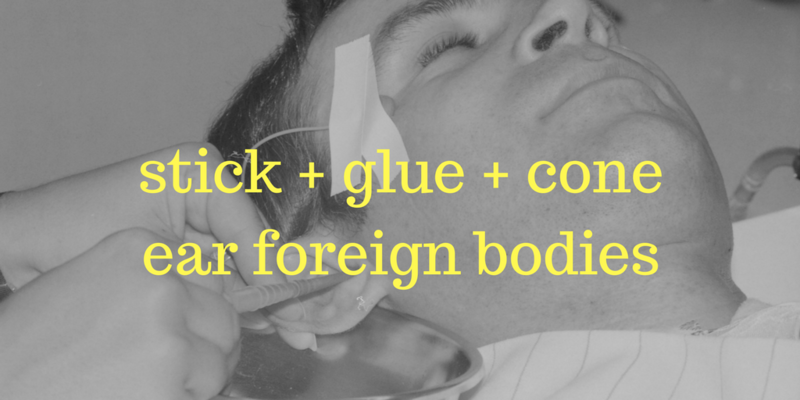 Consider this method when you have a calm patient and an easily visualized foreign body with smooth surfaces.